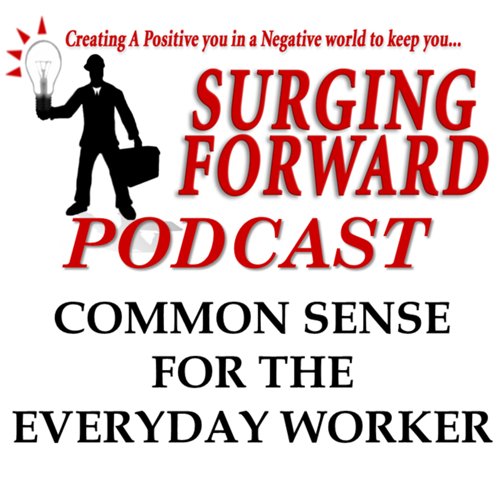 Hello and welcome to the Surging Forward podcast where we are creating a positive you in a negative world. Been a busy week this week, Thank you for some of the comments on the site as well as by email. If this is your first time listening than welcome to the surging forward team. This is a show that provides workforce training and tips to help you excel as we continue to stay positive in this negative world. You can send us an email with any questions you might have to Tradesman@surgingforward.com, or it may be easier to go to our website at surgingforwardpodcast.com and click on the contacts button. News flash we are now on twitter so if you have twitter account follow us there at twitter.com/SurgingForward . We just started so go ahead and click to follow and help us spread the positive message. Not really sure how twitter really works but we are all in a learning mode. Also thanks to all those listening on ITunes, Stitcher and Google play. If you enjoy this show please don’t forget to subscribe as this helps in our ratings for reaching more people also you will get each new episode as it comes out. Remember you can go to the website at surgingforwardpodcast.com to listen to any past episodes or to review any of the episodes. Now here is this episodes Tip of the week: Are you a professional at what you do or are you just doing just enough to get by? If you have stopped learning than your just getting by. Hello fellow electricians, I am doing some research for an episode on my leadership for tradesman in the workforce podcast. I plan do to a show on the importance of having an electrical license. Many of the people I talk to say that it is not needed, though I disagree would love to hear some opinions that I can share on the podcast. Boy what a response I got. The response was overwhelmingly yes it is needed not only because it is required in some states but because it shows credibility to others that you have at least a basic understanding of what is involved with your particular profession. Ben said it very well when he stated: The license is for the customer, not us. The license gives the customer a fallback if there is a problem. Virginia permit laws are set up so a homeowner can pull their own permits and just work whoever they want to. It seems like a good idea for the homeowner because they can usually get the work done cheaper. Sometimes though, the unlicensed “electrician” might not be as experienced as he or she let on. When they can’t figure out the three way switch or why the kitchen light comes on when you plug up the toaster and just disappears, the homeowner can go after whoever’s name is on the permit. The problem is, the homeowner’s name is on the permit so they are responsible for their own problems. Commercial and industrial guys that work for another company usually don’t have this problem because they blanket under the company’s licenses. There are a few GC’s that require a licensed electrician present at all times on commercial and industrial projects though. If you are the guy that has the license and your boss can’t be there the whole time, you are more valuable than the guys that aren’t licensed. Plus it looks good on a resume’ and it shows that you respect your trade and want to excel in it. What I like best about his response is that it shows that you respect your trade/profession and it shows others that you have qualifications. Jack also gave a great stamen as follows: The license (Competency Card) tells the public that the holder thereof has completed a number of work hours, in the trade, as required by the Authority Having Jurisdiction (usually the state, county or city) and has passed an approved examination that tested his knowledge of that trade; and that he/she is qualified to perform work under that license, within certain parameters set by law. Again the gives a bit of confidence to the consumer when work is being done on a home. Here are a few more comments from another Facebook site which talks about electrical. Chuck stated that it May depend on the type of job in the work he does he not only has a license but also has many other certifications showing that he has been trained in various types of skills. Rustin stated that the requirements for certification/licensing can vary depending on the state you are in and are not always reciprocal. This can be in issue but when you have a license in one state though it is not reciprocal, you may not have to meet all the requirements but still have to take another test. One person stated that the state they are in did not need a license but he has seen a lot of bad jobs that he has had to correct So many don’t think that a license or certification is needed I hear all the time my company won’t pay for my license. My friends the license is yours and it show your proof of competency. You have to pay for your driver’s license 1 to 7 years which shows that you should have a basic understanding of driving on the road. The more certifications, licenses or any other qualifications that you have in your resume will help you be able to move up and make more money as you keep Surging Forward. Again it also shows others that you have the basic skills needed. We also need to educate the homeowner and/or client would you want someone wiring your house that does not have the certifications, How about installing a new heating system and run the risk of carbon monoxide poising from and incompetent installer that was cheaper. I think not, so many people look at what the negative guy is doing and how he gets away with breaking all the rules. Why not start a new trend and look at all the positive people who take pride in their work and are not worried about losing their job because they know they can find another one they may be even better. Again it has been my pleasure to bring you a positive word for this week. Drop me a line either by email, Facebook or now even twitter.